The GRB field of astronomy has experienced a cascade of astonishing discoveries and new surprises over the past three years. In this paper we discuss some of the highlights of GRB afterglows, in which the ING telescopes have played an important role. With the new generation of GRB satellites to be launched, new exciting results are on their way, giving important insights into the nature of the progenitors of GRBs, and also into the high redshift universe. Twenty five years after the discovery of Gamma-Ray Bursts (GRBs), there was still a very strong debate about their distances. One camp put them in the halo of the Galaxy, the other among the most distant objects known in the universe. It was expected that the discovery of a counterpart at other wavelengths would resolve this issue. Searches for counterparts were not successful because the error boxes typically had the size of several degrees. Such positions could be refined by triangulation with the Inter-Planetary Network (IPN), but the few GRBs with such accurate positions were, with hindsight, not observed rapidly enough to give a chance of detecting afterglows. With the launch of the Italian-Dutch satellite BeppoSAX (near the end of 1996), which carries two X-ray Wide Field Cameras (WFCs) on board, burst positions became available with typical error circle radii of 3 arcminutes (a factor of ~4000 improvement in localisation). These positions were made available rapidly (several hours after the burst). When the second burst detected by one of the WFCs came along (GRB 970228) the team of the late Jan van Paradijs, consisting of the two former PhD students Titus Galama and Paul Groot, were ready for it. They pointed the WHT towards the WFC X-ray source position 21 hours after the burst, and on March 8, the INT was used for a follow-up image. Using these images, they were able to identify the first optical counterpart of a GRB (van Paradijs et al., 1997), which marked the beginning of a revolution in our understanding of GRBs (see Figure 1). This discovery, together with that of the X-ray afterglows discovered by our Italian colleagues with the Narrow Field Instruments (NFIs) of BeppoSAX is among the top 5 of major scientific breakthroughs of 1997, according to Science. 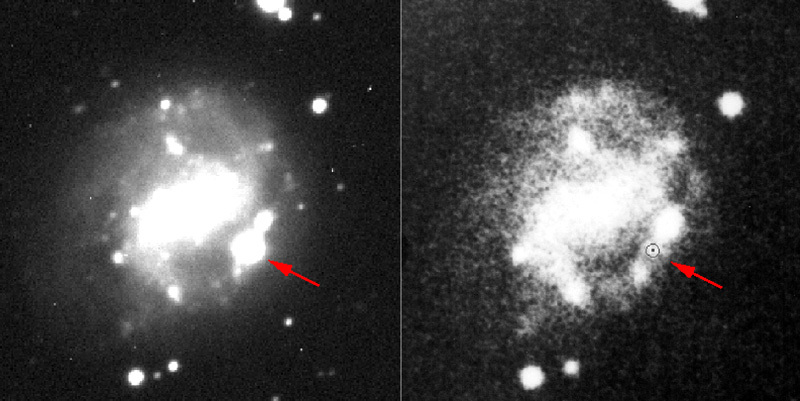 Later HST images showed a faint nebula around the optical transient (OT), for which Keck has now been able to determine the redshift: z=0.695. These results confirmed that GRBs occur at cosmological distances and together with the fluxes received at Earth, indicated that GRBs are the most powerful photon emitters in the Universe. The first OT for which the redshift was determined was GRB 970508: z=0.835 (Metzger et al., 1997). It was also the first burst for which a radio afterglow was discovered, by Dale Frail and colleagues (Frail et al., 1997), and the ING observations of this burst showed evidence for a spectral transition (Galama et al., 1998a). Titus Galama and co-workers also constructed a radio to X-ray spectrum at day 12 after the burst and showed that the observations can be understood in terms of the relativistic blastwave (or fireball) model (see Figure 2; the R-band light curve of this burst is also shown). In this model, a huge amount of energy is dumped into a compact region, which causes a relativistically expanding blast wave that sweeps up the surrounding matter. The electrons in the shock are accelerated to a power-law distribution in energy and radiate synchrotron emission. The bulk of the electrons have the Lorentz factor gamma-m and radiate near the peak frequency nu-m (corresponding to gamma-m). This produces the typical synchrotron spectrum shown in sections II and III of Figure 2. Section I is modified by synchrotron self absorption (frequency nu-a), and section IV is located above the electron cooling frequency (nu-c); cooling causes a steepening of the spectrum. As the blast wave slows down, the peak and cooling frequencies move to lower frequencies as a power-law in time, which, together with the fact that the spectral shape is also a power-law (in distinct regions), causes a power-law decline of the afterglow. Using the Keck 10-m telescope, Shri Kulkarni and his colleagues, were able to determine the redshift of the counterpart of GRB 971214 at z=3.42 (Kulkarni et al., 1998; the most distant GRB detected so far). The implied energy output, assuming a standard cosmological model and isotropic energy release, was an amazing 3×1053 erg. 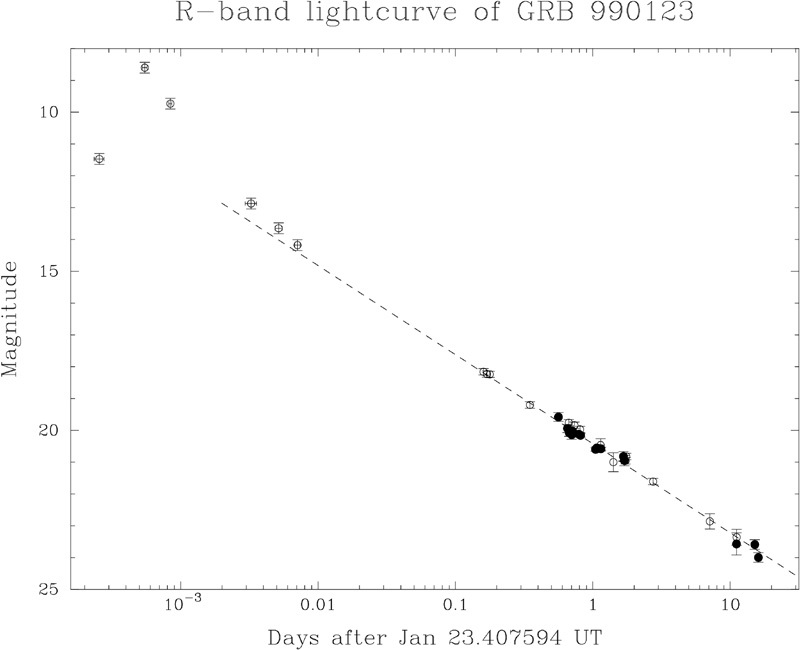 After GRB 970228, the redshift determination of GRB 970508, which showed that GRBs come from cosmological distances, and the outstanding energy output of GRB 971214, the GRB community was waiting for the next surprise from the sky. On Sunday April 29, 1998, two of us (Titus Galama and Paul Vreeswijk) were analysing images taken the days before with the Anglo-Australian Telescope (AAT) and ESO's New Technology Telescope (NTT). They were frantically looking for a faint stellar-like object to disappear in later frames, but couldn't find any good candidates. As Paul was on the phone with his sister, who called him up for his birthday, Titus shouted out: "Hey, what's this??? Paul, look at this!" It appeared Titus had discovered the supernova SN 1998bw (see Figure 3 and Figure 4), which marked the beginning of a revolution in not only the GRB field, but also the SN community. With our late supervisor Jan van Paradijs, we very conservatively estimated the chance of finding a supernova in the GRB error box, with the time of collapse around the time of the burst, and found it to be 10–4. This being so small, the notion that some GRBs and SNe are physically related became fairly hard to reject (Galama et al., 1998d). Since this discovery, more evidence for a relation between SNe and GRBs has been found. Josh Bloom and colleagues suggested that the late-time afterglow of GRB 980326 could be explained by an underlying SN 1998bw type supernova at a redshift of about unity (Bloom et al., 1999). 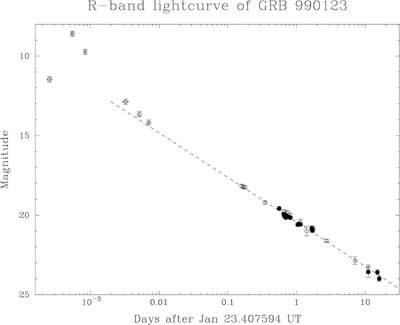 Our team, after re-analysing just about all the available data of GRB 970228, to minimise differences in analysis by different groups, has also found evidence for a supernova contributing to the light curve of GRB 970228 (see Figure 5). These findings call for accurate determination of afterglow magnitudes, not only at early times, but especially at late times (~20–30 days after the burst), for which the WHT is very suitable. The link between GRBs and SNe was one of the ten major breakthroughs in 1999 according to Science. After nearly two years of afterglow studies, GRBs continued to surprise the community with the discovery of the afterglow of GRB 990123. The first report was of an afterglow of R~18th magnitude, which was not very unusual at around 4 hours after the burst. 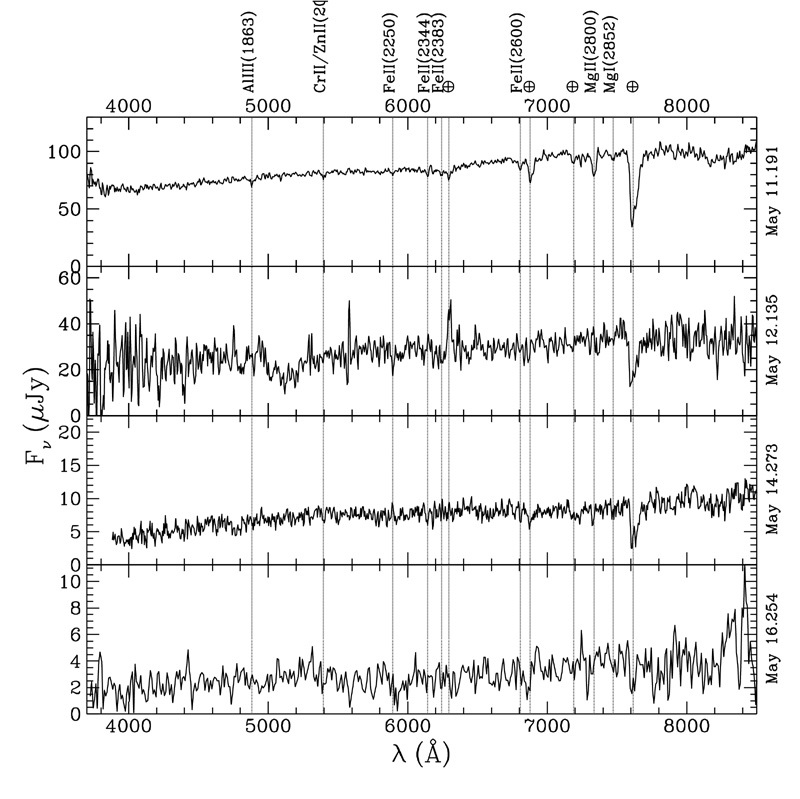 However, the ROTSE team had slewed their robotic telescope to the burst position only 20 seconds after the BATSE alert and when they analysed their images at the reported position of the afterglow, they found an incredible V~9th magnitude flash, i.e. somebody with binoculars looking at the right part of the sky would have been able to see it! The total isotropic energy output of this burst beat that of GRB 971214: over 1054 erg. Combined with the BATSE data and images taken at other telescopes, including the ING, we were able to conclude that the BATSE gamma-ray burst itself, the optical flash responsible for the 9th magnitude, and the late-time afterglow, came from three distinct emission regions. Figure 6 shows that the optical flash probably smoothly connects with the late-time afterglow, which means that if OTs are caught at an early time, they may be very bright. Observations of bright afterglows should become possible with the launch of HETE-II, which will provide accurate positions of the prompt X-ray burst accompanying the GRB within a minute. In the past year many bursts went off at Southern declinations. With the first unit of the Very Large Telescope in use, our team was able to determine the redshifts for three afterglows (two are actually lower limits, since only absorption features are detected and these could in principle be caused by an intervening cloud in the line of sight): GRB 990510, GRB 990712 and GRB 991216. For GRB 990510 we also studied the evolution of the metal absorption lines (see Figure 7). We found no evidence for a change in the equivalent width of the MgII feature, suggesting that the atoms responsible for the absorption are not in the immediate vicinity of the site of the explosion (Vreeswijk et al., 1999). The combination of their power and their large distances, makes GRBs extremely interesting as possible probes of the high redshift Universe. When we have a vast sample of redshifts available, and we find more evidence that GRBs are directly related to the formation of massive stars, they can be used to trace the star formation rate up to the very early Universe. And just like quasars, they can be used to study the chemical composition of the inter-galactic medium. In several GRB afterglow spectra, multiple absorption systems have been detected through the identification of redshifted UV metal lines. When these GRBs were caught, they were typically fainter than R=20. With the launch of HETE–II (expected date of launch: 23 Jan. 2000), however, it will become possible to catch GRB afterglows when they are still very bright, at R ~15–16. This is due to the fact that HETE will be able to make an accurate position available immediately (less than one minute), whereas the WFC positions of BeppoSAX typically are available after 4 hours. At that brightness, high signal-to-noise, high resolution spectroscopy will become feasible. For some bursts it may even become possible to catch them when they are brighter than R=10, but this requires an automated activation procedure of the telescopes. ESO is already investigating the possibilities of automated activation of the VLT, and hopefully other observatories will follow. Coming from cosmological distances, GRBs have the possibility of being gravitationally lensed. Although this possibility is estimated to be less than 0.1% (Blaes & Webster, 1992), with 3 bursts per day going off over the whole sky, detecting a lensed GRB is just a matter of time. With the clear variability that GRBs display, the time lag should be easy to determine, and assuming a mass model for the lensing galaxy or cluster, one will be able to estimate the value for H0 (as has been done for several lensed variable quasars). Following up GRB afterglows has pushed traditional ground-based observing into a new mode of operation — of frequent and substantial overrides. Thanks to the support of the time-allocation committees and observatory staff, and goodwill of the large majority of observers, this has actually worked very successfully. Without the target-of-opportunity possibility, many of the above mentioned exciting discoveries would not have been possible. Clearly, in the longer term, a move towards queue/reactive scheduling will benefit both GRB astronomers and the rest of the community.